This skin is so awesome, I'm impressed by the notification box and the nice animations. Colors are superb. Glad you let Mike do a WB out of it He knows how to do it right. This is more plain than you're usual stuff. Almost like you played it safe on this one. The window frames are nice as is the rainlendar skin that was spawned by this skin. But this one doesn't do anything for me. Not your finest hour. Now your DFX skin 'Obsidian' - that's way nice and one you should be definitely turning into a winamp skin. though the carbon one looks better than the lighter one. Has more personality. Winshade mode on carbon is sweet too. 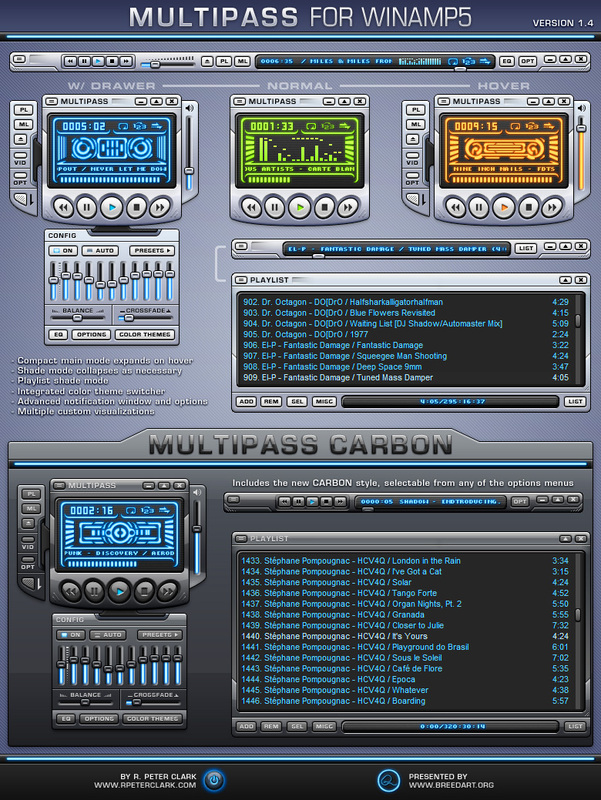 This is my favourite skin of all the winamp skins out there, trully nice! Plz tell me how can you fix the error ? I used Winamp 5.05. Very nice skin, will be the only one i need to download again....very sleek, of course if you do another version I'm sure i'll pick that up too...amazing skin, looks like you put a lot of effort into it, very nice. um, how is this installed? the best skin I have ever seen. Thank you for amazing work! B.E.A-utiful. Perfection defined. I have never seen a winamp skin pushed so far. Just excellent! Incredibly elegant design and functionality. The Notification window on new plays is neato. Beautiful work. tyty. Still an awesome skin all these years later!